Pope Francis Announces Two New Saints In Portugal On 100th Anniversary Of Their Vision : The Two-Way The "little shepherds" were small children when they reported a vision of the Virgin Mary 100 years ago in Fatima, Portugal. The farm town has since become an important Catholic shrine. 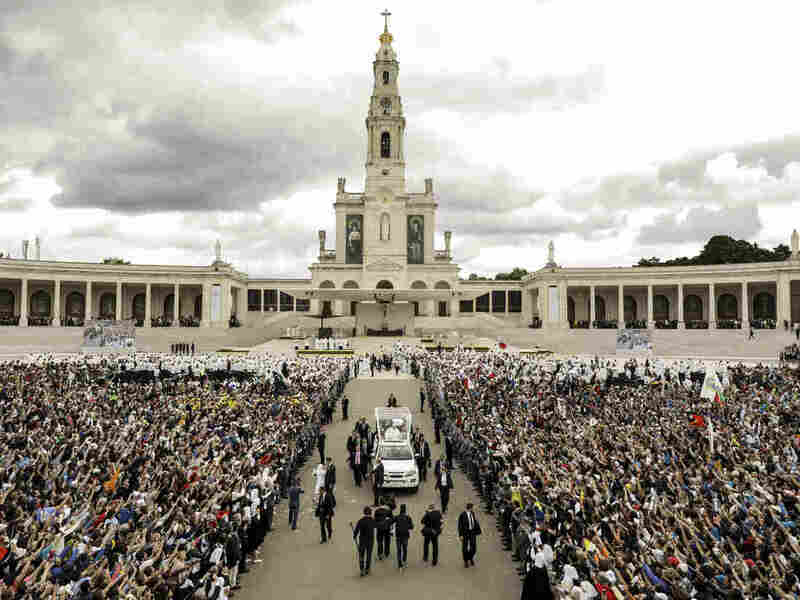 Hundreds of thousands of pilgrims gathered in Fatima, Portugal, on Saturday, where Pope Francis canonized two new saints. Jacinta and Francisco Marto were children 100 years ago when their visions of the Virgin Mary marked this place as an important Catholic shrine. Pope Francis canonized two new saints Saturday at the beginning of a Mass in Fátima, Portugal. Francisco and Jacinta Marto were small children in Fátima on May 13, 1917, when they said they saw a vision of the Virgin Mary while they were tending sheep. The farm town became an important Catholic shrine as a result of the children's visions, drawing pilgrims from around the world. Many such visitors were at the Mass where the canonization was announced Saturday, and the declaration was met with joyous applause. The Associated Press reports that, according to the Vatican, about 500,000 people watched from the square in front of the shrine's basilica. One visitor from Ireland told The Associated Press, "It is amazing. It's like an answer to prayer, because I felt that always they would be canonized." According to the website for the Shrine of Fátima, the children saw a series of apparitions over the course of several months. By the time the Virgin Mary appeared to them for the sixth time, they had been joined by tens of thousands of Catholics who had come to pray with them. As NPR's Tom Gjelten has reported, the process of becoming a saint in the Catholic church is extensive. "Humanitarian work alone, however, is not sufficient for canonization in the Catholic Church. Normally, a candidate must be associated with at least two miracles. The idea is that a person worthy of sainthood must demonstrably be in heaven, actually interceding with God on behalf of those in need of healing." The New York Times speculated in March that the Martos might soon be canonized, since the pope had officially recognized a miracle attributed to them. The two children were first beatified 17 years ago, long after their deaths in 1918. Their cousin Lucia, who also is said to have seen the vision, is now being considered for beatification, the first step toward sainthood. She died in 2005 at the age of 97, having become a nun and written several memoirs about the visions she and the other children saw. Alison Roberts reported for NPR's Newscast that Francis is the fourth pope to visit the shrine at Fátima, but the centenary and the canonization of the new saints gives Pope Francis' visit special significance for Catholics.